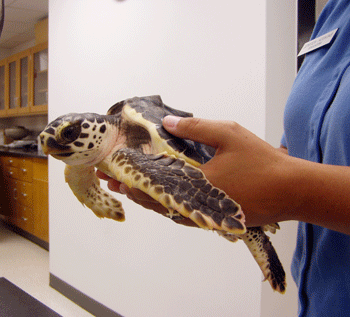 A juvenile sea turtle receives medical assistance at CMAST. The Aquatic Animal Health group is led by Dr. Craig Harms, and performs investigations of marine mammal and sea turtle morbidity and mortality, identifies novel pathogens and parasites of aquatic animals, and conducts clinically-applied research aimed at improving health and welfare of captive aquatic animals. Investigating antimicrobial resistance patterns in cloacal bacteria of loggerhead sea turtles. 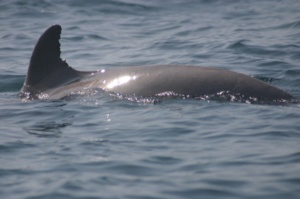 Marine mammal stranding investigations in collaboration with NOAA National Marine Fisheries Services. Sea turtle health assessments in collaboration with NMFS and NC Wildlife Resources Commission. Identification of novel pathogens and parasites in marine mammals, sea turtles, sea otters and alligators. Evaluating efficacy of post-operative analgesics in fish. Determining immunomodulating effects of adverse water quality conditions on fish. The Marine Animal Health group, directed by Dr. Craig Harms, delivers veterinary care to the NC Aquariums at Roanoke Island, Pine Knoll Shores, and Fort Fisher, the Karen Beasley Sea Turtle Rescue and Rehabilitation Center on Topsail Island, and university field laboratories such as the Pamlico Aquaculture Facility in Aurora, NC. Health maintenance of collections of the North Carolina Aquariums at Pine Knoll Shores, Roanoke Island, and Fort Fisher. Veterinary services for the Karen Beasley Sea Turtle Rescue and Rehabilitation Center, Topsail Island. Development of new surgical and medical treatments for captive sharks, sea turtles, and cephalopods. Attending veterinarian for the CMAST Fisheries Research Laboratory and the Pamlico Aquaculture Facility.